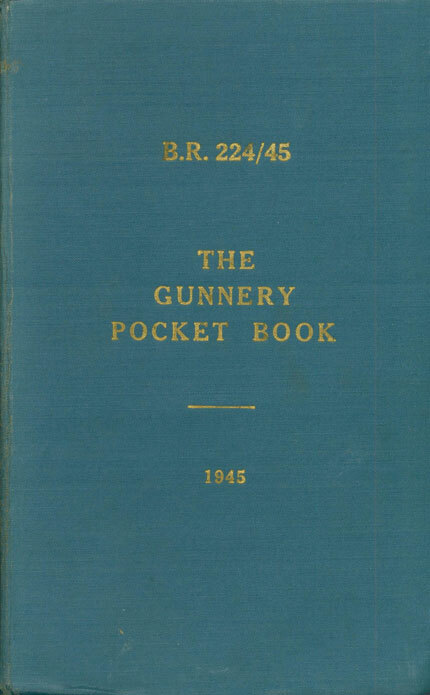 The Gunnery Pocket Book, B.R. 224/45, 1945 was created near the end of WW II and therefore represents the peak of British WW II gunnery. This edition has a few small corrections and updates that were added by hand in 1949 that are reflected in the text. B.R. 224/45-The Gunnery Pocket Book, 1945, having been approved by My Lords Commissioners of the Admiralty is hereby promulgated for information and guidance. B.R. 224-The Gunnery Pocket Book, dated 1932 and reprint of 1938, and B.R. 154-The Ammunition Pocket Book, 1935, are hereby superseded and all copies should be disposed of in accordance with the instructions in B.R.1-B.R. Catalogue. SECTION 3-THE PRINCIPLES OF RADAR, OPTICAL RANGEFINDERS AND INCLINOMETERS Paras. Look-outs and Optical Instruments Paras. This list is not exhaustive. Certain abbreviations have been omitted, e.g., those for the greater part found on packages to which reference should be made in the appropriate handbook, particularly the Handbook on Ammunition. A. Letter usually denoting foremost centre-line turret or mounting. A.A.1 Anti-aircraft rating 1st class. A.A.2 Anti-aircraft rating 2nd class. 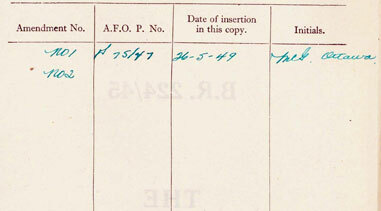 A.A.3 Anti-aircraft rating 3rd class. A .D.P. Air Defence Position. A.F.C.C. Admiralty Fire Control Clock. A.F.C.T. Admiralty Fire Control Table. A. F.O. Admiralty Fleet Order. A .I.N.O. Assistant Inspector of Naval Ordnance. A.P. Armour Piercing, Air Ministry Publication. A.S. Angle of Sight. Admiral Superintendent. A. S.A. Ammunition, Small Arms. A. S .0. Armament Supply Officer. A.V.G.I. Auxiliary Vessel Gunnery Instructor. A.V.G.O. Auxiliary Vessel Gunnery Officer. B. Letter usually denoting second foremost centre-line turret or mounting. B.D. Between Deck (Gun mountings). C.A.F.O. Confidential Admiralty Fleet Order. C.B.R. Confidential Book allowed to Ratings. C.P. Central Pivot. Calculating Position. Common Pointed. C.P.B.C. Common Pointed Ballistic Capped. C.R. Calibre Radius. Commencement of Rifling. Close Range. C.R.1 Control Rating First Class. C.R.2 Control Rating Second Class. C.R.3 Control Rating Third Class. D.A. Direct Action (Delay Action occasionally). D.C. Damage Control. Depth Charge. D.E.M.S. Defensively Equipped Merchant Ship. F.C. Fire Control. Full Charge. F.O.G.M.O. Fitting Out Gun Mounting Officer. F.O.G.O. Fitting Out Gunnery Officer. G. Followed by a number indicates Gunpowder Grain size. G.A. Gunnery Aircraft (Radar Set). G.B. Gunnery Barrage (Radar Set). G.C. Gunnery Close Range (Radar Set). Gnr. † Dagger Gunner (Gunner Instructional). G.S. Gunnery Surface (Radar Set). H.A.C.P. High Angle Calculating Position. H.A.C.S. High Angle Control System. H.A.D.E.S. High Angle Director Eyeshooting Sight. H.A.D.T. High Angle Director Tower. H.G.R. Hitting Gun Range. Higher Gunnery Rating. H.S.C.T. Hot Solventless Carbamite Tubular (cordite). I.N.O. Inspector of Naval Ordnance. L.G. Lewis Gun. Large Grain (gunpowder). L.R.1 Layer Rating First Class. L.R.2 Layer Rating Second Class. L.R.3 Layer Rating Third Class. M.L. Metal Lined. Muzzle Loading. M.P.I. Mean Point of Impact. M.T. Temporary local colloquial mark for an emptied package. N. Letter on Armament Stores for Naval Service. N.C. R. Naval Cordite Regulations. N.M. & E.R. Naval Magazine and Explosive Regulations. N.O.I.O. Naval Ordnance Inspecting Officer. O. Marking of certain watertight doors (see Chapter 12). O.A. (O) Ordnance Artificer qualified in Optical Instruments. P. Letter signifying Pedestal type mounting. Followed by a number may indicate a gun, or mounting on the Port side. On a package may indicate the size of gunpowder (pebble). Pdr. Pounder, as in 2 pdr., 3 pdr. all Armament Depots. A complete list may be found in Regulations for Naval Armament Services, Part 2, Appendix 1. P.S. Powder Substitute (practice projectiles). P.S.G.I. Patrol Service Gunnery Instructor. P.S.S.G. Patrol Service Seaman Gunner. Q Letter usually denoting third centre-line turret where more than four such turrets are fitted. Q.O. Rating Qualified in Ordnance. Q.R.1. Quarters Rating First Class. Q.R.3. Quarters Rating Third Class. R.C.1. Radar Control Rating First Class. R.C.2. Radar Control Rating Second Class. R.C.3. Radar Control Rating Third Class. R.D. Research Department usually followed by a letter or figure to indicate formulae. R.D.F. Term superseded by RADAR. R/E & D.U. Range to Elevation and Deflection Unit. R/E.U. Range to Elevation Unit. R.N.C. Letters preceding Naval S.C. Cordite lot numbers. R.Y.P.A. Roll, Yaw, Pitch, Alteration of course (Instructional Apparatus). S. Denoting Tube for Strikerless lock. When followed by a number may indicate a gun or mounting on the starboard side. S.A.S.O. Superintending Armament Supply Officer. S.S. Sight Setter. Star Shell. T & P. Time and Percussion. T.I.R. Time Interval Receiver. Target Indicating Room. V.S.M. Vickers, Sons and Maxim. W.A. Warning of Aircraft (Radar Set). W.C. Warning Combined surface and aircraft (Radar set). W.S. Warning of Surface craft (Radar set). X. Letter usually denoting the turret or mounting on the centre line next before the after one. Y. Letter usually denoting the after turret or mounting on the centre line. Z Mark indicating Lead Azide Detonator.